As we move through the centenary of World War I, it’s time to put Australia’s war history into a more realistic perspective. 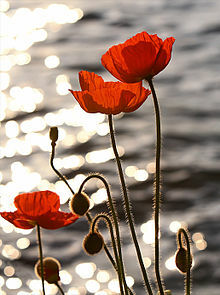 We do ourselves a disservice, as well as the men who served and those who lost their lives, when we insist they were brave all the time and were immune to the effects of such a confronting war. This war fundamentally changed how Australian servicemen saw the home country and gave them, and us, a sense of a different identity. Today’s Remembrance Day post is a story of one man’s death, only two months before that momentous day on 11 November 1918. Like all the thousands of war deaths, it left the world a lesser place with the loss of talent and ability. 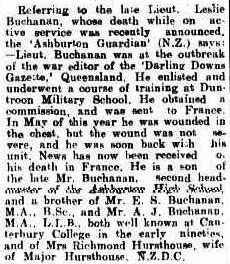 My search for a person to write about happened almost entirely by chance, other than I was looking for men who came from, or enlisted at, Toowoomba on the Darling Downs and who died during the World War I.
Leslie Samuel Buchanan was a one-person ANZAC when he enlisted in Toowoomba on 17 January 1916. He was born in Ashburton, New Zealand about November 1876[i], son of John Edgar and Mary Elizabeth Saunders Buchanan[ii]. 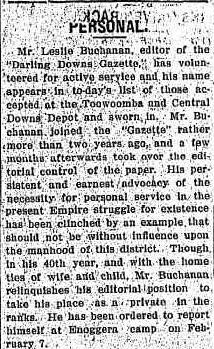 On his enlistment papers[iii] he gave his next of kin as his wife, Alice (aka Alyce[iv]) Buchanan of Eleanor St, Toowoomba and noted he had one child under 16 (actually an infant). He was 6 feet tall with grey eyes and brown hair and stated his occupation was “newspaper editor”. His only experience in the military was four years in the volunteer cadets, possibly at high school or university. Initially Leslie enlisted as a private and was attached to D Company, 41st Battalion with the service number 4732. 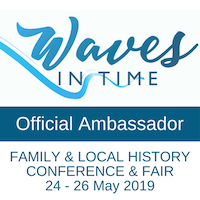 As a newspaper editor his enlistment was publicised far and wide: Farmer and Settler, Moree Gwydir Examiner and General Advertiser, Maryborough Chronicle as well as the more obvious Darling Downs Gazette. Strangely it is the Maryborough article that will become relevant later in the story. PERSONAL. (1916, February 10). Freeman’s Journal (Sydney, NSW : 1850 – 1932), p. 15. http://nla.gov.au/nla.news-article115305390 Note: Townsville is an error and should be Toowoomba. It’s likely it was Leslie’s professional career rather than the cadets that made him a candidate for officer training and the Darling Downs Gazette tells of his committed study to gain entrance to Duntroon Military College where he graduated as a 2nd Lieutenant, gazetted on 1 October 1916. At this point, on 29 December 1916, Leslie was attached to the 13th reinforcements of the 31st Battalion. Gaining his commission had delayed his departure to France by nearly a year and may have saved him from the slaughter at Fromelles – a bloodbath for the 31st. It wasn’t until 7 February 1917, that Leslie joined the rest of the 13th reinforcements of the 31st Battalion on troop ship A18 Wiltshire ex Sydney en route for England. He landed at Devonport (Plymouth), England on 11 April 1917 and marched into the 8th Training Battalion at Hurdcott, Salisbury, England. Unidentified (1917). Page 22 of the Queenslander Pictorial, supplement to The Queenslander, 17 February, 1917. John Oxley Library, State Library of Queensland. Is Leslie Buchanan one of the two officers in the front row, centre? Lt Buchanan was taken on strength with the 31st Battalion on 13 July 1917 and sent to France via Havre. He was commissioned as a Lieutenant on 11 August 1917 and on 7 August was sent to the 1st ANZAC Corps School in the field. Less than a week later, on 17 August, he was taken to hospital sick with malaria (and later anaemia), then transferred to the 1st General Hospital at Etretat on 31 August. He remained there until 24 September when he was discharged to the 5th Division Base Depot, fit for active duty. (I confess that so far I remain confused about these movements and the medical facilities to which he was sent). From here, on 9 October he re-joined his unit. Less than three weeks later he was taken by the Field Ambulance back to hospital and didn’t re-join his unit, as best I can tell, until 8 December 1917. Leslie had been in France for five months but in hospital for much of this time, and on active service in the field only about four weeks by my estimate. It begs the question why he felt he needed to enlist if his health was not great. 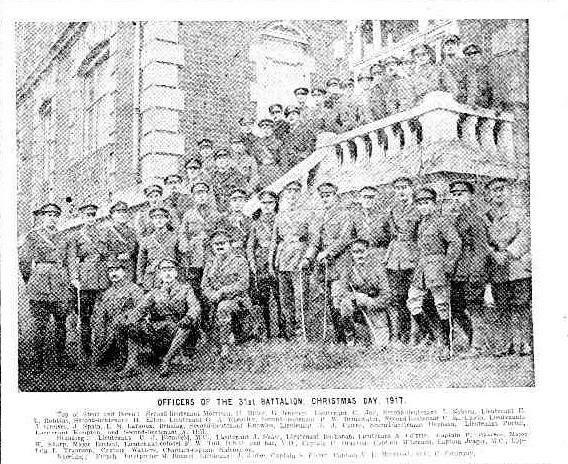 Nevertheless he is photographed with his fellow officers from the 31st over Christmas 1917, an image which made its way to an Australian newspaper. OFFICERS OF THE 31st BATTALION, CHRISTMAS DAY, 1917. (1918, March 28). The Week (Brisbane, Qld. 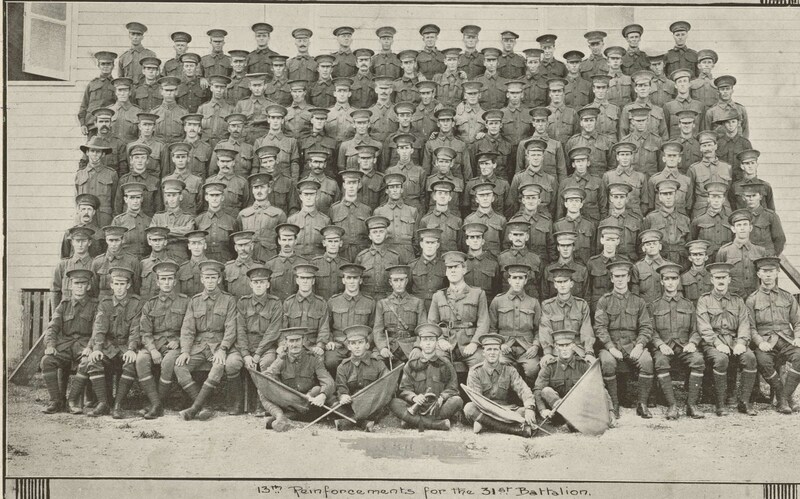 : 1876 – 1934), p. 13. http://nla.gov.au/nla.news-article188923487 Lt L Buchanan is third from the left in the row standing behind the kneeling men. Lieutenant Leslie Buchanan, well known in journalistic circles and formerly editor of the ‘D. D. Gazette’ writes to ‘Sirdar’ of the ‘Daily Mail’, as follows: ‘The dawn is just breaking, and Fritz had left us comparatively alone, so I am taking a short spell in my very insecure dugout, having so far dodged the scrap-iron which the Hun heaves at us with very little intermission. Our division has been pretty heavily engaged for the last month, and I have been in the front line practically since the middle of January, but so far we have stopped the Boche on this sector at any rate— and the sector at present, is the most important in France. I’ve had one shave and one wash in a month. We look a queer crew, but that doesn’t matter much when things are as they are. We live in hopes and are still hammering the Hun.’[v] It’s difficult to know when the letter was written as the publication date was August 1918. Leslie was trained at the gas school in the field on 15 March 1918 and newspaper reports reveal he had taken on additional responsibilities. He also found time to report home: Lieut. Buchanan, in which he reports himself as being well and fortunate enough to come through a big engagement without hurt[vii]. Based on unit war diaries Lt Buchanan undertook regular patrols with his men, often in the middle of the night throughout May 1918[viii]. During this period, the Battalion was stationed in the field at Vaire-Hamel for 53 days without relief, said by the CO to be a record for the British units in France. It was during this time that Leslie had an uncanny brush with death, described in the papers as a “miraculous escape”. The story is appended for you and linked here, but the essence is that the only thing which saved him from death was that the bullet, which hit him centre chest, had struck the button on his clothing, stopping it from killing him. Hence the annotation on his file, and also in the message to his wife, that he was “wounded but remaining on duty”. While he makes light of it in his letter home to his wife Alice, I can’t help wondering if this near miss affected him in the coming months. There are no notations I’ve found which make adverse comment about Leslie in the war diaries, yet on 3 July 1918 he was court martialled[ix] on two counts: (1) for being AWOL on 4 June 1918 until 7 June when he was apprehended and (2) for being drunk at Cobie on 11 April 1918. Although his plea to both counts was “not guilty” the enquiry found him not guilty of the first count, but guilty of the second. He was demoted and given a strong reprimand. His service seniority was also reduced to 16 January 1917 (not 1916). What is interesting, though, is that the Battalion had arrived on 2 June in Rivery, on relief after their 53 day stint on the front. The Battalion also received congratulations from Brigadier General Tivey for their work on holding an important sector of the line and consolidating it while keeping the German troops contained. On 23 July 1918, there is a report on a Lt Leslie Buchanan interleaved with “our” Leslie’s file, but the age and unit number are inaccurate. However I can find no other serving officer with this name so perhaps it was him. The findings were that he was suffering from overwork but that “there were no signs of Subuale (??) and no bacilli were found. His temperature was normal. He is gaining weight and in good condition.”[x] The condition had been caused by military service but he was fit to return to duty. If this is indeed him, then perhaps it explains what was to happen. Leslie was admitted to the 41st Stationary Hospital on 23 August 1918 and sent to the 4th Army Convalescent Depot on 30 August with gastroenteritis. On the evening of 4 September he was seen, by a private from the Royal Hussars, near the villa where he was quartered and taken to his room by two Australian soldiers. They took him to his room around 8:45pm, and removed his tunic, collar and boots before covering him over on the bed. Later, about 10:30pm, a Capt Barclay of the RAF had looked into the room and seen Leslie sleeping[xi]. However early in the morning of 5 September 1918, a body was seen lying on the ground outside the building. Captain Ironside was called in around 7:15 – 7:30am and found it was Lt Buchanan. It was estimated that he had died about six hours previous. The body was then sent to 3 General Hospital for pathology testing. It appeared he had fallen out of a window on the second floor[xii]. A Court of Enquiry[xiii] was convened and witness statements taken including that of Capt Ironside. Pte Edwards of the 10th Royal Hussars had seen the two Australians helping Buchanan where he was collapsed on the ground near the villa. When asked if Buchanan was drunk the Hussar said “he was in a collapsed condition”. What did he mean? Was Leslie drunk, or suffering from the effects of gastro? When the court asked whether he thought Buchanan was drunk, another witness, L/Cpl Dover, also said “he was in a collapsed condition” but that “he was a very moderate drinker taking only one drink with each meal”. Capt Ironside was asked further questions and confirmed he had checked Buchanan’s room that morning after finding his body. The “bed had been slept in, the window was open and one pane had been broken. There was nothing to indicate why this officer had climbed out the window”[xiv]. There was no blood in the room and he considered the blood on the body had been incurred when landing on trees below the window. The opinion of the Court was that death had occurred by accidentally falling from the window[xv]. 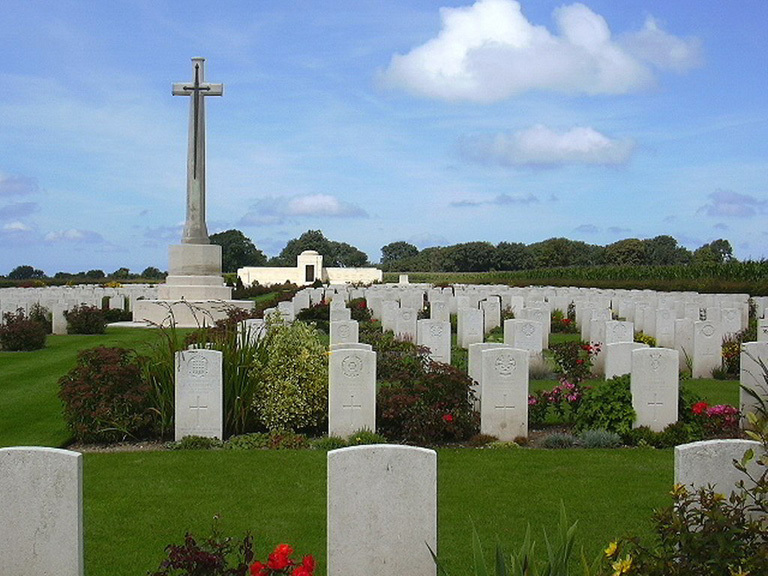 Lieutenant Leslie Samuel Buchanan was buried with full military honours at Mont Huon Military Cemetery, Le Treport, France (Plot 7, Row F, Grave 13). “He was a man possessing a big nature, and nothing mean or petty could find countenance with him. His decision to enlist came as a surprise to his friends owing to his having family obligations and holding a position such as he did. His decision once formed, however, was final, his chief reason being the call of conscience and duty. 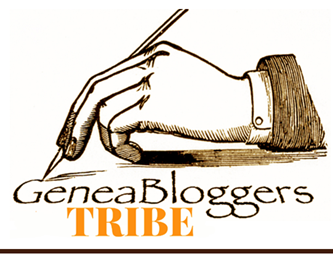 He stated that he could not from the editorial chair urge the eligible to enlist while he himself was eligible, and he hoped that by his example others would be induced to act similarly“…. “But it was those only who had the fortune to work with him who could value the man at his true worth. His big, generous heart never failed to respond and he was ever ready to extend a helping hand to those needing it . His kindly advice in his professional work was of valuable aid to those on his staff and his experience was always at the disposal of all when the need arose”. These comments are very similar to those expressed by Cpl HT Hill in his response to Alice’s Red Cross enquiries: “he was very, very popular, keenly musical, well educated and a good soldier and very good hearted“. Cpl Hill, from Bundaberg, had travelled with Leslie on the Wiltshire to England. He said that Lt Buchanan had “gone well back behind Amiens to a school and no more was heard of him. The contention is that he fell from a train“. Leslie had served his country and his battle was over, but it was just beginning for his wife Alice. It was to take her several years as she tried to find out more about her husband’s death. Having first been told he died of illness (gastroenteritis), then that he had died from an accidental fall, she was understandably bewildered. By January 1919 she still hadn’t heard “the real cause” of her husband’s death. Somewhat strangely her mother-in-law, living in Windsor, England, seemed to be getting more up to date information that Alice, even though his wife was Leslie’s next of kin. It didn’t help that Alice’s appeal to the Red Cross only brought more confusion, with one report suggesting Leslie had fallen 1000 feet off a cliff, and another that he may have fallen from a train. The official response was that these reports were “garbled versions based on hearsay”[xvi]. However she says “as you can imagine it has upset me very much”[xvii]. She even tried to write to the mayor of Le Treport but the letter had been returned as having insufficient address[xviii]. “I have never received any account of the real cause of how he died.” (January 15, 1919)[xxii]. Eventually she received a letter from the Army giving her a synopsis of the findings of the Court of Enquiry, dated 26 March 1919. Whether she gained any consolation, or more anxiety, from hearing Leslie “had (apparently) fallen from a window on the second floor”[xxiii] is something to ponder. “I would give much to hear from someone who was with him toward the end”[xxiv] she says when she receives the official memorial scroll and the field glasses she had been chasing up. 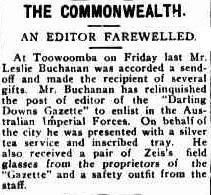 They had caused her angst because the army assumed they were official issue and would be returned to stores whereas she informed them they were “his own property and a gift from the Darling Downs Gazette of which he was the editor”[xxv]. While she eventually received the field glasses, there is no indication that his watch was every returned. Among his belongings were his chess set and the soldier’s friend, the housewife (a simple sewing kit), as well as letters, photos and 11 notebooks[xxvi]. Wouldn’t it be interesting to know what was in the latter? Over the years Alice received the Memorial scroll and King’s message (29 October 1921, three years after his death), the British War Medal (16 June 1921), the Victory Medal (8 May 1923) and the memorial plaque (19 December 1922). While she stayed with her family in Sydney for a while after Leslie’s death, she returned to Toowoomba where she died on 22 July 1930, aged only 48 years. Alyce and Leslie’s only child, daughter Joyce, was just 16 years old. She had been active in fund-raising throughout the war and very much involved in the cultural life of the city. 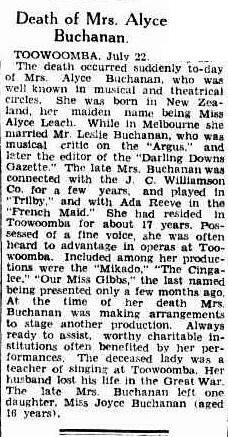 Alyce Buchanan is buried in the Drayton and Toowoomba cemetery. [i] An Ancestry tree states his birth date as 17 November 1876. http://person.ancestry.com/tree/76510328/person/46344469213/story. His service record (page 144) states it as 20 November 1876. [iv] She regularly signs her name as Alice, but by the end of her life it is consistently Alyce. 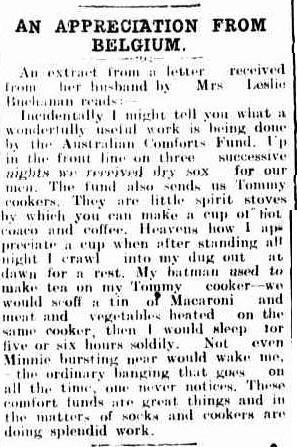 [vi] SOCIAL AND PERSONAL (1918, April 25) Queensland Times (Ipswich) (Qld: 1909-1954) page 3 http://nla.gov.au/nla.news-article119924600. Also reported in other newspapers (one of the advantages of Leslie having been a newspaperman). Interestingly there is no indication in the records that Leslie was the editor of this magazine, rather the AWM and other references indicate it was a Philip L Harris. https://www.awm.gov.au/collection/LIB18425/. Perhaps an interesting project for someone to follow up? [ix] Buchanan, Lt Leslie service record, page 145. There are summary figures for courts martial at the end of each month’s war diary for the battalion – a far from uncommon incident. 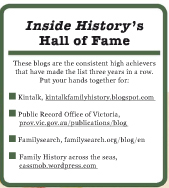 You can also search the National Archives of Australia for the term “Court Martial”.